Another action-packed day went down at the Shooting Sport Centre in Suhl — where India and the People’s Republic of China keep battling atop the medal table — and four more events took place: 25m Pistol Women Junior, 10m Air Pistol Men Junior, 50m Rifle 3 Positions Women Junior and Trap Mixed Team Junior. 16-year-old first-time finalist Camille Jedrzejewski of France won the first ISSF gold medal of her career in Suhl, where, with great timing, she nailed two consecutive 5-hit series, taking the lead at a crucial moment and finishing atop the podium with 35 total hits. Jedrzejewski prevailed over People’s Republic of China’s Qiu Danhong — participating in her first international competition. The 19-year-old Chinese shooter desperately tried to overtake her French rival by firing a perfect 5 in her 10th and final series, but fell short and closed her debut with 34 hits and the silver medal in her pocket. Alongside Jedrzejewski and Qiu, Bulgaria’s Miroslava Mincheva took bronze with 25 hits. It’s the second Junior World Cup medal for the Bulgarian 18-year-old, who took silver two years ago in Gabala (AZE). The People’s Republic of China also placed 1st and 2nd on the team podium: team 1 took gold with 1713 points, while team 2 took silver with 1708. The bronze was awarded to the Republic of Korea, who concluded in 3rd place with 1706 points. In the 10m Air Pistol Men Junior final, India’s Saurabh Chaudhary signed a fantastic gold medal-World Record combination at the end of an exciting final, where he duelled with and prevailed over Republic of Korea’s Lim Hojin and People’s Republic of China’s Wang Zhehao, who respectively took silver and bronze. 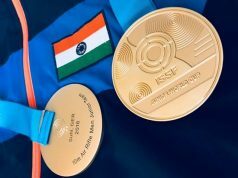 The 16-year-old Indian shooter was standing in 7th place at the end of the first series, after firing four of his five shots in the 9th ring. Since the, however, Saurabh scored 10.0 or higher with 16 of his remaining 19 shots — including two 10.8s — climbing up the table and eventually setting a new World Record with 243.7 points. It’s the first ISSF medal for Saurabh Chaudhary, who previously placed 4th at last year’s ISSF Junior World Championship in Suhl. First-time participant Lim, who led the pack for the first half of the match, slid down after a series of four bad shots midway through the final — 9.4, 9.8, 8,9 and 9.0 — finishing in 2nd place with 239.6 points and taking silver. The podium was completed by Wang — the previous Junior World Record holder and gold medalist at this year’s Junior World Cup in Sydney (AUS). The 19-year-old Chinese shooter signed off with 218.7 points, winning bronze. The team gold medal was awarded to India 1, who scored a total of 1730 points and equaled the previous Junior World Record. The People’s Republic of China took silver with 1720, while India 2 placed 3rd and scored 1719 points. People’s Republic of China’s phenomenal shooter Wang Zeru secured the fourth medal of her extraordinary 2018 season. In Suhl, indeed, the 18-year-old talent won gold in the 50m Rifle 3 Positions Women Junior event, adding it to the 3 Positions gold won at the ISSF World Cup held in Changwon (KOR) last April, the 3 Positions bronze won at the ISSF World Cup held in Fort Benning (USA) last May, and the Air Rifle bronze won at this year’s previous Junior World Cup held in Sydney. Wang, who was standing in 3rd place at the end of both the kneeling and prone positions, only grabbed the lead at the 43rd-shot mark, after shooting with great consistency during the standing position and thanks to an amazing combination of shots fired in the elimination stage. Eventually, Wang took gold with 456.3 points, followed by United States’ 20-year-old Morgan Phillips, who made her Junior World Cup debut in Suhl this year and finished with 455.5 points. Muriel Zueger (20) of Switzerland — the leader of the match after the first two positions — pulverized the 57th place ha obtained at last year’s Junior World Championship, placing 3rd in her second Junior World Cup start and securing bronze with 443.3 points. The People’s Republic of China and the United States of America also placed in 1st and 2nd position on the team podium, respectively scoring 3497 and 3484 points. The Chinese team also set a new Junior World Record. The team bronze medal was awarded to Germany 1, who totalized 3479 points. An extremely balanced match closed the third competition day, as Italy’s Teo Petroni (20) and Erica Sessa (19) bagged the Trap Mixed Team gold medal, besting the Australian team composed by Nathan Steven Argiro (19) and Alexis Elsa Preston (17). It was Preston who missed the last and decisive target, allowing the Italian couple to walk away with the brightest medal. It’s the second consecutive gold for Petroni and Sessa, who placed 1st also at this year’s Junior World Cup in Sydney. 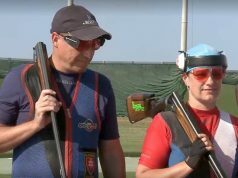 Along with the gold, the two Italian shooters also set two new records: in the qualification phase, in fact, the duo hit 138 total targets, besting the mark set by themselves in Australia. Furthermore, they also set another new World Record by hitting 40 of their 50 targets in the final. Argiro and Preston, instead, took silver with 39 hits. 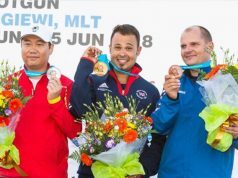 Bulgaria’s 16-year-old Selin Ali and 17-year-old Ivan Georgiev completed the podium in 3rd place, hitting 30 of their 40 targets and both winning the first ISSF medal of their respective career.